Will this proposal mean more flights over Great Dunmow? We believe that this proposal will represent an improvement for the town of Great Dunmow as a whole, however it depends where you live or work within the town or surrounding area. There are two departure flight paths near Great Dunmow – an eastbound route that passes northeast of the town, and a southbound route that passes to the west of the town. Departure noise currently experienced in Great Dunmow would be mostly from flights following the southbound route that passes west of the town, as this is closer and generally the noisier of the two routes. It is this route that would have far fewer daytime flights, so if our proposal goes ahead people in central and western Great Dunmow should benefit. The eastbound route that passes northeast of the town would be flown more, which means people northeast of the town may notice an increase in flights, however the additional flights would generally be 1-2km to the north east of Church End rather than directly overhead. Please use the maps in our consultation document to determine the effect on your particular location. Will this proposal mean more flights over Hatfield Heath? We believe that this proposal will have little effect on the number of flights over Hatfield Heath, however it depends where you live or work within the town or surrounding area. There are two departure flight paths that both currently pass over Hatfield Heath – an eastbound route and a southbound route. Whilst these routes ultimately head off in separate directions, the flight paths for each route do not diverge significantly until after passing Hatfield Heath. Therefore switching flights from one to the other will make little difference to the town itself. As the routes diverge after Hatfield Heath, areas to the east and south of the town may notice a difference: areas to the south would experience a significant reduction in daytime departure overflights (occasional flights only), while those areas directly to the east would experience a significant increase in overflights. Why are you doing this consultation? We want to switch flights between two existing departure routes at Stansted Airport – reducing the use of one and increasing the use of another. At the moment, flights towards the south are being kept lower for longer, below Heathrow arrivals that come in from the east over Essex and Kent. This proposal means that most daytime flights can initially follow the route to the east, avoiding Heathrow traffic and climbing continuously, so that the majority are above 7,000ft before crossing the A131 (south of Braintree). This consultation is part of the first phase of the London Airspace Management Programme (LAMP) to deliver the Future Airspace Strategy (FAS), developed by the CAA with the support of the aviation industry. The FAS is the UK’s vehicle to deliver the benefits of a Single European Sky. The proposal would improve the efficiency and overall environmental performance of the airspace associated with Stansted Airport and also will enable benefits at Gatwick and London City Airports. We are seeking to realise those benefits as early as possible. It started on Monday 16th June and lasts for 12 weeks. This period was agreed with the CAA and is in line with the government’s code of practice on consultation, which states: Timeframes for consultation should be proportionate and realistic to allow stakeholders sufficient time to provide a considered response and where the consultation spans all or part of a holiday period policy makers should consider what if any impact there may be and take appropriate mitigating action. The amount of time required will depend on the nature and impact of the proposal (for example, the diversity of interested parties or the complexity of the issue, or even external events), and might typically vary between two and 12 weeks. We encourage you to provide your feedback before consultation closes on Monday 8th September. Does the consultation involve a new route? No. There are no new routes bring proposed. We are proposing a different usage of existing routes only. Will it mean more flights overhead? Will I see/hear more flights? This consultation is about how we modernise the existing routes to achieve the optimal solution operationally and environmentally. The consultation is not about the general trend of increasing numbers of flights. The net effect of these proposals will be less noise – aircraft will climb higher, more quickly on departure. However, flight paths will change – and this may mean some areas will be overflown more than today, others less, and some will not notice any significant change. Will more people be overflown? No. Currently, the air traffic is split over two routes. This proposal aims to move most of the daytime flights onto one route. So fewer people overall would be regularly overflown, but those that are, would experience an increase in air traffic overhead. As there are no new routes being proposed, the CAA has advised that this consultation should be conducted through the Stansted Consultative Committee. However, it is open to the public to respond to if they wish, through our website at www.nats.aero/lampstansted. Why don’t you stop the number of flights from growing? It is the CAA’s responsibility to regulate the UK’s aviation sector, including the number of flights. It is NATS’ and Stansted Airport’s responsibility to efficiently manage these flights. Will you be compensating those that would get more traffic as a result of your proposals? The existing noise insulation schemes for Stansted Airport will remain in place for those affected by a high level of noise. This proposal does not affect those areas. Neither the CAA’s CAP725 Airspace Change Process nor the DfT Government guidance require any additional compensation for either existing or changed noise impacts. Why should some communities suffer with more traffic for air route benefits that add to profits for the airports and NATS? The proposal provides an overall benefit to both the operations and the environment. It is important to note that the doubling of Stansted overflights for some areas is offset by a reduction to almost zero for others so there are community benefits as well. There are also major benefits in terms of reduced CO2 per flight. The consultation document contains all the information required to enable you to determine the potential effects of the proposal. Feedback can be given using the ‘Submit Your Feedback’ link on the website www.nats.aero/lampstansted. Why should we believe what you say in your consultation document? At NATS and Stansted Airport Limited we take our responsibilities very seriously and whenever we present proposed changes we always seek to present the best available information. Furthermore, the process for airspace change is regulated by the CAA. As part of this change process we will be required to analyse performance after one year and demonstrate that the change is working as anticipated. If the CAA determines this not to be the case then they may require us to make further changes to rectify the situation which would be costly and time consuming. It is in nobody’s interest to have incorrect information in the consultation material. Why has there been a recent increase in noise over my area? Have you made these changes already? NATS is required to go through the airspace change process, as documented in the CAA’s airspace change guidance, when proposing permanent changes to the airspace design. Permanent airspace changes cannot be implemented until a formal proposal has been submitted to, and approved by the CAA. An exception to this is trial procedures, designed to test technical airspace design issues. There have been no permanent changes during the consultation period and therefore any recent changes to the perceived behaviour of aircraft in your vicinity are not due to the proposed changes. Air traffic control is required to consider a range of factors when determining where aircraft fly, such as other traffic in the area, the aircraft types, wind direction and weather in general. This means that the way in which airspace is used may vary on a day to day basis, and even flight by flight basis (hence the wide swathes in which aircraft may be seen in route and flight path maps in the consultation document). This variation may contribute to a perception of changed airspace usage where the airspace usage has in fact remained unchanged. Experience from previous consultations indicates that the consultation process sometimes leads people to take more notice of the routes that are already above them. It may therefore seem like a change has occurred when in fact the communities have become more sensitive, as a consequence of the discussion around air traffic. Questions regarding existing airspace design or airspace policy should be directed to the CAA. The Civil Aviation Authority (CAA) is, amongst other things, responsible for the planning and regulation of all UK airspace, including the navigation and communications infrastructure to support safe and efficient operations. The CAA is staffed by civilian experts from the CAA and military experts from the Ministry of Defence (MoD) with experience of commercial, business/private, recreational and military aviation. The needs of all users are accommodated, as far as possible, taking into account safety, environmental, economic and national security considerations. The proposal is subject to this consultation and analysis of all the feedback received by our design teams and then assessment by the CAA before a decision is made on whether or not to implement it. This means that any change would not be implemented before winter 2015. How do I get a paper copy of the consultation material? The consultation material is best viewed online where ‘zoom’ facilities can be used with the maps. We have not produced paper copies of the consultation material, however all of the documents are freely available to download in PDF format, and may be printed and distributed without restriction. Note that when printing, small details on the smaller-scale maps may be difficult to see unless printed on larger paper such as A3 size. This is because the maps are optimised for online viewing where ‘zoom’ tools can be used. How are you consulting with people who don’t have internet access? We have agreed the consultation requirements with the CAA. Internet access is widespread; free internet access is available in most local libraries. Why aren’t you consulting directly with the local communities? The consultation is open to all to respond. We have issued a press release, and we have contacted all the representative bodies on the Stansted Airport Consultative Committee (STACC) and the National Air Traffic Management Advisory Committee (NATMAC); we have encouraged these bodies to cascade the information to their members. This follows the process agreed with the CAA for this proposal. We have also gone beyond the agreed process by seeking to present to the association of local councils, giving parish councils the opportunity to be briefed and ask questions on the proposal. Why should I bother responding, what difference would it make? All community feedback from this consultation will be given due consideration. We believe that there is a good case for change based around the combined benefits to the network, to operators and, on balance, to local communities as it would further the DfT objective of reducing the number of people regularly exposed to noise from departures. The role of consultation is to make this balance of benefits explicit, and allow those with a local knowledge and outlook to comment. Should the consultation exercise highlight any significant and relevant issue that we have not taken into account in our case for change, then we will be duty bound to act on it. The CAA will review the feedback and will not approve a proposal if we have not given due consideration to relevant issues. Why haven’t you offered any options? We are not seeking to change the position of any existing routes at this stage. This proposal fits into Phase 1 of the LAMP which is primarily focussed on airspace to the south supporting Gatwick and London City Airports, but nonetheless needs this change to achieve network-wide benefits for the aviation economy, overall CO2 and noise reduction. Phase 2 of LAMP will consider more fundamental changes to the routes for Stansted, along with those for Heathrow and Luton Airports which are interlinked with those from Stansted. More significant changes will be subject to their own separate design and consultation processes. LAMP Phase 2 is not planned until at least 2018, this means design and consultation will commence in 2015/16. How do I know that you have considered my response and that of others? I want to be able to see all the responses to the consultation. At NATS and Stansted Airport Limited we take our responsibilities very seriously; we will consider all responses and we will ensure that relevant points are appropriately dealt with (see FAQ Why should I bother responding, what difference would it make?). The consultation responses, analysis and subsequent design process will all be made visible to the CAA as part of any submission we make to them. They will only approve an airspace change if they have evidence to show that we have followed the correct processes. Allowing open access to the consultation responses would raise data protection issues. Ultimately, the independence of the CAA as the airspace regulator provides the assurance that due process will be followed. A feedback report providing analysis of the issues raised and numbers of consultation responses will be published, most likely in December 2014. What will you do with my response? Will you be giving feedback on the results of the consultation? We will collate and analyses all responses. A feedback report detailing the results of the consultation will be published on this website, most likely in December 2014. Responses will be made available to the CAA as part of any Airspace Change Proposals submitted to them for changes covered by this proposal. This will allow the CAA to assess whether we have taken relevant information into account. How does this fit into the consultation involving NATS and Gatwick Airport earlier this year? This proposal fits into LAMP Phase 1, which is focussed on the network of routes to the south (primarily Gatwick and London City). The proposed Stansted changes are key to achieving the network efficiency to the south, as well as an overall benefit to local operations and environmental performance. What is the process for changing airspace? The process for changing airspace is defined by the CAA in their publication CAP725, CAA Guidance On The Application Of The Airspace Change Process. For further information on the legal framework for airspace changes in the UK, including DfT Government guidance, see the consultation document. Why can’t the aircraft route over another area? We are not proposing changes to these routes in this consultation, only the proportion of aircraft using them. This means that more aircraft would fly along some of the existing routes and fewer along others, but the routes would be over the same areas as today. I think concentrating flights is wrong – why don’t you spread them out? Concentration of flights is in line with Government guidance issued by the Department for Transport (DfT). If you wish to discuss the objective of concentrating air traffic please contact the CAA or the Department for Transport. Is this to do with expanding Stansted airport by the back door? Is this to do with an additional runway at Stansted Airport? No. These changes are focussed on making the existing air route network more efficient. This proposal has no relationship to additional runways – at Stansted or any other London airport. Who will check that the development does what you say it will? Should the proposal be approved and implemented, NATS and Stansted Airport will be required to demonstrate to the CAA that the proposals achieve the target objectives. In accordance with CAP725, NATS and Stansted Airport will provide reports on the performance of the development against the target objectives in terms of delay, safety and environmental performance based on the first 12 months of operation. The results of these post-implementation reviews are made available to the public on the CAA website. Will there be another consultation involving Stansted Airport and LAMP? For how long will this new airspace design be operational? The Stansted operation is closely linked, in terms of local airspace to the southwest, to the network of routes for Heathrow and Luton. This airspace is not being addressed until Phase 2 of the LAMP development around 2018-2020 (following the harmonisation of Transition Altitude). Any further changes in respect of LAMP Phase 2 will be consulted on when Phase 2 design work commences. Airspace changes have no defined lifespan. Why don’t you wait until Phase 2 of LAMP to make changes? The introductory sections of the consultation document describe why Phase 2 of the Stansted development would not be until at least 2018/19. The changes we are proposing now will enable the operational and environmental benefits discussed in the consultation material to be realised in the 3-4 year period leading up to that time. How has air quality been taken into account in the proposal? Government guidance on airspace change states that, due to the effects of mixing and dispersion, emissions from aircraft above 1,000ft are unlikely to have a significant impact on local air quality. This is the case with our design options as there are no proposed changes affecting flight paths below 1,000ft. For more detail see the DfT Government guidance. Yes. Safety is our first priority. The proposals are for increased usage of existing departure routes that already meet all the required safety standards. The safety of the proposal will be assessed by the CAA prior to their decision as to whether to approve it for implementation or not. Are the current flight paths / routes unsafe? No. Safety is our first priority. The UK has one of the best safety records in the world. There would be no change to the routes due to this proposal, only to the proportion of traffic using each route. If our controllers believe there is any threat to safety, flights would be delayed from entering the air route system, and those already en route would be safely managed. Will air traffic controllers be able to cope with rising traffic levels? The air traffic control system has procedures such that if air traffic rises to a certain level, restrictions are imposed to stop further aircraft entering the congested area until such time as traffic levels have reduced. This is (in very simple terms) how safe levels of traffic are maintained. These restrictions cause aircraft to be held on the ground, which causes delays to flights (it affects when flights can take off rather than the overall number of flights). NATS has a good record of reducing delays over recent years. The LAMP project is an example of how NATS and Stansted Airport are being proactive in order to avoid an increase in delays for flights on the Dover route that will occur if nothing is done now. How does your proposal relate to the noise monitor trial? Why don’t you wait for the results of the noise monitor trial before consulting? The noise monitor trial is completely independent from this proposal. That trial is about the accuracy of new ground-based noise monitoring equipment and is not related to airspace design. This proposal (and consultation) is in line with all the relevant requirements laid out in the CAA’s airspace change process CAP725. How does this proposal fit with the RNP route trials on-going at Stansted Airport? The CAA is currently trialling two Stansted SIDs based on a modern navigation standard referred to as Required Navigation Performance (RNP). These trials are designed to test aircraft track-keeping accuracy on routes designed with RNP, to enable the CAA to develop standards for how such routes could be designed in the future at Stansted and other UK airports. The trial is due to run until April 2015 to enable the CAA to collect sufficient data to provide safety assurance it needs to develop its design standards. After this time Stansted Airport will determine whether to put forward a separate proposal to the CAA to make these routes permanent. Neither the trial nor any subsequent proposal to make it permanent is part of this consultation. However, we have considered how any subsequent proposal by Stansted to make the trial permanent would complement this NATS proposal. The trial consists of two RNP SIDs. Each is considered in turn below. The first of the trial SIDs is the Runway 22 (westerly runway) towards Clacton. A density plot for the Runway 22 SIDs is shown in the map below. This is a density plot where the red colouring shows the core areas overflown today by traffic routing towards both Clacton (to the east) and Dover (to the south). This shows all flights, the large majority of which were not following the trial route. The trial route is defined to follow the existing NPR towards Clacton (shown in the map below as the pink dashed arrow). The trial is demonstrating that aircraft using this navigation standard can follow this pink NPR centreline more accurately than those following the older ‘conventional’ navigation definition (the black arrow, which remains for other aircraft not using the trial route). This means that the trial Clacton departures fly over the less populated areas between Hatfield Heath and Hatfield Broad Oak, rather than over Hatfield Heath which the majority of flights following the current ‘normal’ route tend to do. Today’s Runway 22 Dover-bound departure route also passes directly over the western edge of Hatfield Heath (orange arrow in the map below). This means that the town currently gets overflown by aircraft routing both to the south (Dover) and east (Clacton). This proposal would shift almost all the Dover traffic onto the Clacton route, which with today’s routes would make little difference to the overall number of flights over Hatfield Heath as it would simply shift from the orange and white arrow in the map below to the black arrow. However, in combination with the trial route this proposal would mean a significant reduction in overflight of Hatfield Heath. 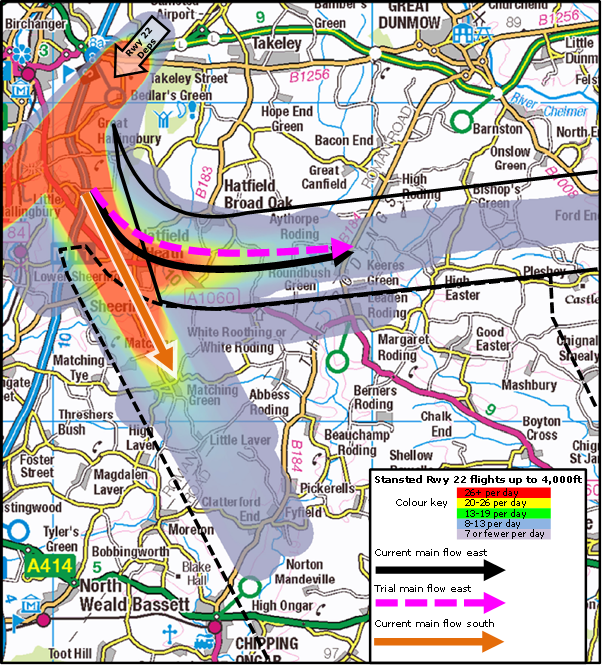 This is because all aircraft certified to fly the RNP trial version of the route heading to either Dover or Clacton would instead fly slightly to the north of the town (pink dashed line in the map below), over the less populated area between Hatfield Heath and Hatfield Broad Oak. The other route in the RNP trial is the Runway 04 route to Dover. This trial route is also demonstrating an improvement in track keeping accuracy on this route; meaning flights following this route are generally further east of Great Dunmow than if they follow the existing non-RNP route. The proposal we are consulting on here would remove almost all the flights from both the Runway 04 trial and ‘normal’ routes to Dover, and instead put them on the Runway 04 route towards Clacton. Whilst there is no RNP trial for this Clacton route, the route itself is further away from Great Dunmow than both the trial and ‘normal’ routes to Dover, and therefore switching flights onto the Clacton route represents an overall benefit to Great Dunmow (see also the FAQ about Great Dunmow). In summary, the proposal we are consulting on here is independent from the trial routes. The trial routes will remain in place to enable the CAA to continue their assessment of the RNP design criteria, so that they may develop design standards. However, once the trials are complete and design standards are published by the CAA, Stansted Airport may seek to use them to make the Runway 22 Clacton RNP trial route permanent; the combination of this proposal and the trial made permanent would mean a marked decrease in direct overflight of Hatfield Heath. Note that making the trial permanent is not part of this proposal and, if progressed by Stansted Airport, would be subject to separate development and consultation processes at a later date.